home / Multimedia / The Holy Land in news / The Holy Land in videos: discover and share! The Holy Land in videos: discover and share! 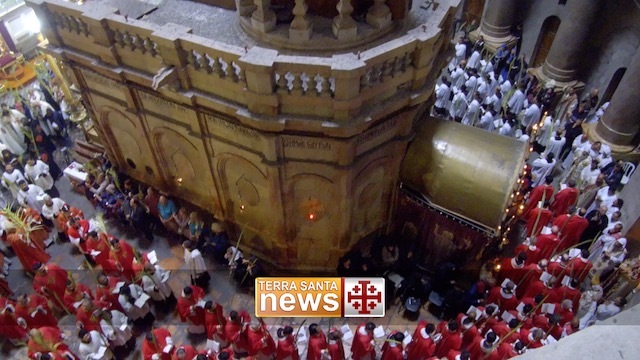 The new section “Terra Santa in video” entirely dedicated to videos produced by Association pro Terra Sancta in collaboration with the Christian Media Center of Jerusalem is now online: a pictorial account of our projects and our activities in the Holy Land. This new area shows the work being carried out with the support of our donors, which has enabled bridges to be built with the local communities, supporting thousands of people in need and aiding children, families, young people and the elderly in the Holy Land. A work carried out alongside the Franciscan friars who safeguard the Holy Places and welcome pilgrims. You can now enter virtually into the Holy Land and literally breathe in the atmosphere that reigns here. You can listen to the voices of the protagonists who are today living in the places of Jesus: the testimonies of the volunteers and missionaries who are working here, the emotions of those who have come to these places as pilgrims, the individual stories of the resident Christians. The new video section will allow you to discover in just a few minutes all of the activities of Association pro Terra Sancta, to follow their progress and to keep up to date. Nearly all of the videos are in 4 languages: English, Italian, French, and Spanish. Choose the project that interests you the most, watch the corresponding videos on the site or on YouTube, and share them with your friends and acquaintances.